Is It Even Possible To Shrink Large Pores? Allow us to preface this answer; we believe, no matter your pore size, proper makeup and skincare will assist you with controlling this, but to also remember you are beautiful no matter what. Looking coiffed and smartly dressed will lift self esteem, and having some large pores on the face won't even matter, much less be noticed by anyone else. So with that we'll get to the question at hand! Our face has thousand of pores and some may appear to be larger than others, especially if you look closely in the mirror. 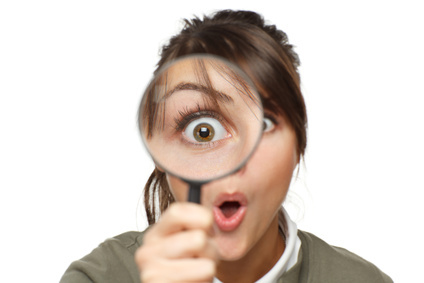 In fact, many women put every square inch of their face under a magnifying glass. A two sided mirror with magnification is not something we recommend since this can create an image in your mind, that your pores appear larger than they really are. We have actually heard the term "size of craters" from some women. The minds eye will definitely blow things out of proportion the same way that darn magnifying mirror does. This same philosophy can be applied to aging skin with wrinkles as well. Besides, do you know of any people that converse with others by getting up in their face the same way you do to yourself in the bathroom every morning? Because if you do, then "minty fresh breath" should be more of a concern. Pores do serve a purpose, such as holding our hair follicles, secrete oil and help our bodies regulate temperature through sweating. Without pores, our bodies would overheat. Having a preoccupation with getting our pores smaller other than the few things we can do to improve the appearance of pore size, is not good for the psyche. How To Stop Pores From Enlarging Further? The crux of the matter is large pores are caused by oily skin types, age and even gender. People with oily skin types typically are the ones most affected by having larger pore size. As sebum and dirt increase within the pore, this causes them to swell, which in turn for many causes acne. As women age, our skin loses elasticity due to collagen depletion, so when we bake in the sun and now have sun damage, get acne or don't keep our faces clean, our skin won't recover as easily as before. Also, you may be genetically predisposed to having large facial pores if your mom and dad had them. And men as a rule have them most often compared to women due to hormonal changes, yet this is similar to women after menopause or during menstrual cycles. Forget the sales pitches you see about shrinking or closing pores by using a certain astringent, cleanser or face cream. Pores do not contain muscles, so closing or shrinking them is not possible. It does however, boil down to good skincare overall. Using one of our gentle facial cleansers twice a day will go far to reducing the appearance of pore size, along with using a microfiber washcloth to avoid over irritating the skin. If you don't have overly sensitive skin, then we recommend also washing after an extended period of sweating. Dirt and oils become increased during high levels of exercise and will congest your pores further. So get them cleaned out as time permits, just don't sweat it though if you are not able to remove your sweat or makeup until evening. This is not an exercise in precision. Just be aware of the extra care faces with large pores require. Don't overscrub your face and do use a moisturizing masque once a week, along with our pH balanced facial toner or one of our face creams daily, since this will go far to keeping skin exfoliated, clean and moisturized, which in turn will reduce sebum production. Never skimp on replacing moisture with a good face cream since oily skin is not moisture. Also, avoid leaving hair conditioners on the face, this is why we recommend washing your face after your shower. Moisturized skin remains plumper and hydrated which helps to maintain the skins' elasticity so the number of large pores won't increase on the face. And yet even with improvement to your skin, if you are still dissatisfied with the final results, then the only other recourse is to visit your dermatologist and have he or she perform microdermabrasion. Of course if having your face scraped is not your cup of tea, then mineral makeup can be the best answer for keeping it simple and assisting with the reduction of the appearance of large facial pores. The proper mineral application technique however, is vital so as to not increase pore size, much less make your pores appear larger than they actually are, which can happen if mineral makeup is applied incorrectly. Some women think a makeup primer is beneficial for this purpose, yet this can increase blockages since you are essentially filling in your pores with a silicone based treatment. This type of silicone primer can also prevent proper melding of your mineral makeup to your skin which then causes your minerals to sit on top of your skin, giving a chalky appearance. This will definitely be less than a desirable finish and cause the skin to look aged. However, if you are desperate to try anything because your pore size has you distraught, then Monistat Chafing Relief Powder - Gel is highly recommended by many women across the internet. One Caveat: because it is nothing but silicone derived (dimethicone) oils that will turn to a powder finish which is what will temporarily fill your pores for a smoother surface, this will not do anything if oily skin is also your issue. Here again, you will experience separation of your minerals which can also include looking greasy or pigments may change color. With experimentation using it with our mineral makeup, you may get a nice smooth finish, and though you'll still want to select the proper mineral makeup foundation formula for your skin type, such as Velvet Rose Petal for oily skin, there is no guarantee you will achieve the desired effect using mineral makeup products when using a primer. Velvet Rose is excellent for keeping excessive sebum production under control and prevent melt out, and can help with soft focus for pores on the skin as well. Experimentation will provide the answer for this skin issue. CAUTION: Velvet Rose Petal is not recommended for sensitive skin types. In which case you would want either Delicate Rose or Dewy Rose followed with use of one of our mineral veils for boosted oil control.